After a lot of searching (and research) we are thrilled to have found not one but TWO new goats for our herd - Tutelo and Kachina. They both bring something very new and different to our current breeding program and we are excited to see what they produce. 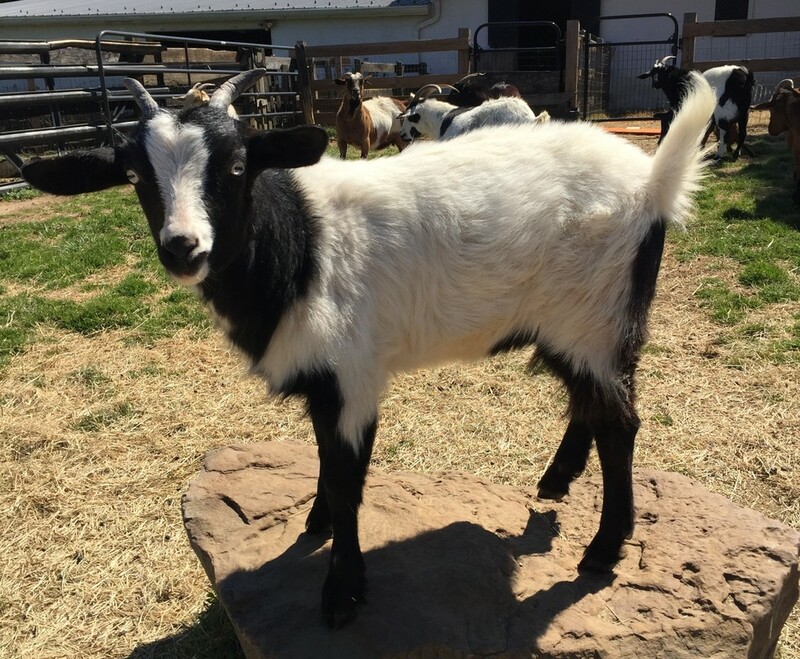 Thanks to Anna Garrett at Solis Occasus Villa in Gasburg, VA for working with us on obtaining these goats from her farm. They arrived late on Jue 24th and we are working to get them settled in and happy on the farm. This striking buckling will be a new herd sire to match with many of our existing does. He's carries a lot of color in his lineage including moon spot genetics and should produce some great looking babies for us in 2019. She's dainty and pretty and so different with her flowery pattern. She also comes with a lot of color in her background and moon spot genetics. It will be a while before she's bred but should be a great match with any of our current herd sires. Roux is our "senior" farm buck. He's got a beautiful rust red coat with crystal blue eyes. He is registered as a short hair, but does have longer hair with white on his back. He was born in February 2010 and is a CRAZY fainter - and his babies are proving to be crazy fainters as well. He is out of Branch Creek Farm Surry and Moonlight Farms Ginger and we got him from Virginia at Oak Knoll Farm. More pictures of him below - you can see his *amazing* horns! We picked up this gorgeous guy from Buck Creek Fainters in Laconia, IN. He's was born on 10/15/13 and is out of Grand Champion Buck Creek Romeo and WCF Aliana. 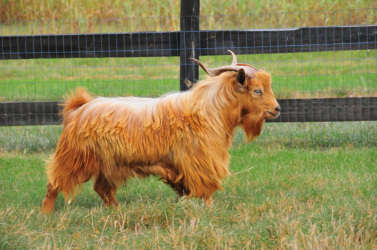 His sire/grandsire show - and have points so he's got some really great bloodlines behind him. We are looking forward to a new era in our breeding program with this buck! He will add a new dimension to our breeding program with completely new bloodlines. He's a big, muscular goat - a very different build from the goats you see in the area. Norrie had her first baby on March 22nd, 2015 and he's gorgeous. He's out of Roux and has gotten a rich red color and blue eyes. Norrie is a new goat to our farm - from Indiana so it's a new bloodline on her side to the area. We have used him for some of our breedings and he is throwing some pretty babies. He's a great looking buck (despite the shedding in the picture)! We brought this pretty girl from Buck Creek Fainters in Laconia, IN. She comes from some heavy duty bloodlines! 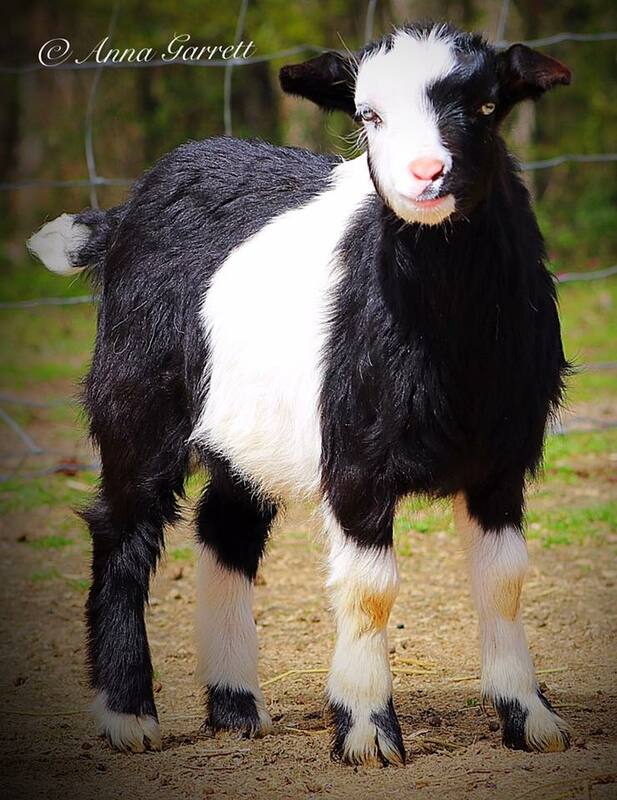 Born 10/25/13 out of Pint Size Zaria and 2x Grand Champion Pint Size LB Sambo this is one nice goat. Her pedigree will have SEVEN (maybe eight) Permanent Grand Champions in it! She's got a different look from the goats in our herd - she's got a pretty little head and a nice, muscular build. Shiloh Dicaptio was just a baby when we got her. She and her mom (Nimue) were delivered to our farm in December 2008. Shiloh is out of Oak Knoll Nutrageous and was born in May 2008. She's got gorgeous blue eyes and more personality than you can imagine. Great Oaks Haphreo Clousseau (Reo) is Tudi's twin also born February 2009 out of Nimue and Savannah Oaks Peterson 535. She's a pretty dark brown, black and white with amber eyes. Great Oaks Mineo Cooper born March 2010. Out of Shilo and Jasper. She's got tons of black "dots" - like a domino. She's also got more energy than all the rest of our goats put together. It is nothing to see her do a flip while she bounces of a wall. She looks alot like her mom and has beautiful blue eyes. Great Oaks Half Pint (since she's petite and half white and half brown) - we are calling her HaPi ("happy"). She was born on September 2010 and is out of Reo and Beaver Tree's Jasper. She's a smaller goat but has really unusual markings and amber eyes. The second of Shiloh and Roux's twins born on January 6th (2014). She's a neat looking black and white - with blue eyes. We will be keeping this girl to add to our breeding program. She's got long legs and a nice look to her. Born out of Mineo and Billy Jack October 11th (2015) - she was lone girl out of our fall kids. 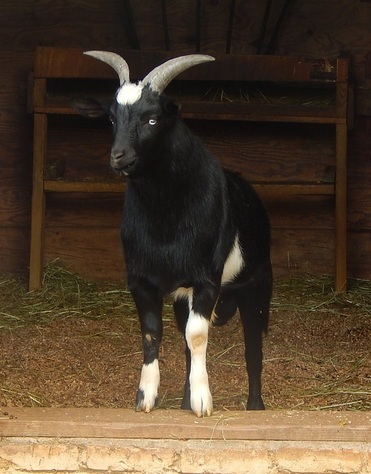 She's a good looking black goat with some neat white markings (her legs almost look striped). Blue eyes complete a striking goat. We are keeping her to add to our breeding herd as some of our older does are due to be "retired"
Doeling out of DiDi and Boone born March 2nd, 2016. She's all marked up - golden brown, tan and white. She's the bigger of the two babies and is very unique looking. She's got a pretty face and brown (not amber eyes). The female born October 13th out of Shiloh and Boone. She's mostly white with big "chunks" of black on her head and legs. She's got blue eyes and may be the friendliest goat we've ever had! First baby out of Cress (bred to Billy Jack) born February 27th, 2018. Jay had to resuscitate her after she was laid on during birth. We were worried about her for a while but she's turned out to be as healthy as can be!